What does the immediate future hold for Rangers? It is 120 days since the chief executive Graham Wallace published an overview of his 120-day business review, but there are still aspects of the running of the club where doubt resides. Two weeks ago, the Ibrox board announced that they were "considering a possible equity issue" to raise £4m. Their hope was that an institutional shareholder would underwrite the offer - ensuring that the full amount would be raised - before it was opened to all existing shareholders to see if they would invest to retain the size of their stake. Yet even the Stock Exchange announcement carried the caveat that "there can be no certainty on the outcome of these discussions" with the leading shareholders. The Union of Fans released a statement raising their concerns about the possibility of Mike Ashley, the owner of Newcastle United, underwriting the issue and so increasing the size of the near 5% stake he already holds in Rangers International Football Club. There now seems little likelihood of that occurring, though, not least because under Scottish Football Association rules no individual can hold stakes of more than 10% in two clubs. The share issue itself so far remains uncompleted, since no Stock Exchange announcement has been made. Some inside Ibrox had hoped to finalise it this week, although institutional shareholders have seemingly shown little appetite for putting more money into Rangers. The reality is that the £4m will be used to fund the club and pay off the £1.5m in loans still owing to the shareholders George Letham and Sandy Easdale, who is also chairman of the Rangers Football Club board. Should the full amount be raised, it will likely provide Rangers with enough financial support to reach the end of the year. In the meantime, the annual accounts are due to be published next month, once audited, then the board intends to hold the annual general meeting - probably in October - and seek permission from shareholders to offer new shares to non-shareholders in a fresh issue. In his 120-day review, Wallace said that the board's intention was to seek shareholder approval for a new share issue in the autumn, however the fall in season ticket sales - prompted by continuing distrust between the fans and the board - left them needing to seek a solution to their immediate financial issues first. Rangers, in effect, remain bedevilled, given the board and shareholders' inability or unwillingness to finance the operation of the club and the necessary additional investment that is required. This is the backdrop to the team's attempts to build a solid foundation to this season's bid to gain promotion back to the top-flight. Rangers remain a club that lacks long-term stability and any sense of connection or shared values between the directors and the fans. While that relationship remains fractured, there is little prospect of the rebuilding process being fully completed. Progress has not been particularly swift on many of Wallace's aims, including the fundamental one of restructuring the club's finances and seeking the external investment required to underpin the club's ambitions. The attempt to appoint a chief football operations officer has stalled, after talks with the former Rangers and Bayern Munich midfielder Christian Nerlinger failed to deliver an agreement. While the idea is sound - not least because Rangers still do not have a properly functioning and extensive scouting network, let alone the kind of medical, performance and strategy support structures expected of a club of this size and the stature it wants to regain - it seemed impractical to try to recruit somebody now when the club's finances are so fragile. The wage of the individual alone would be substantial, but there would be significant associated costs in setting up the infrastructure and appointing new personnel. Rangers cannot currently sustain those costs. The process of setting up fan liaison board has begun, but Saturday's visit of Dumbarton will provide an indication of the level of disaffection amongst the fans. Some intend to buy tickets on a match-by-match basis, having chosen not to renew their season tickets, although there are additional costs incurred by the club for policing and stewarding 'walk-up' supporters. The re-emergence of Charles Green brought a new round of white noise to the story of the club, but the reality is simple: Rangers need money and the board is rapidly running out of options. Dave King remains committed to investing in Rangers, via a larger share issue, but so far the board has chosen to stick to its strategy of seeking £4m initially. That might reflect concern that a shareholder vote might not deliver the necessary permission to offer shares to non-shareholders - Sandy Easdale held the 28% of proxy votes at the last AGM - although a restricted share issue at this stage does not require a prospectus to be published. 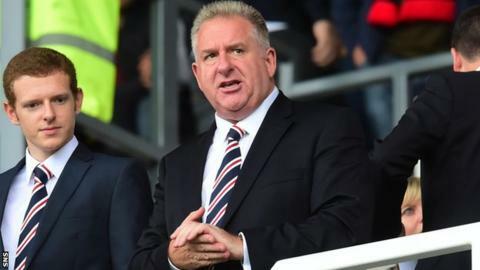 Wallace identified a number of improvements and initiatives that Rangers require, and also the level of funding it takes - he estimated £20m to £30m - but it is the financial demands that are critical. No other investors are lining up to put money into the club. Options are limited.